Once again, cherished vocalists Maria Jane Loizou and Gabe Alfieri will grace the stage with a program sure to delight. Blankets and folding chairs are encouraged. In the event of inclement weather, please check this site, or our Facebook page. Wednesday / July 13, 2016 / 6:30 p.m. The Lisa Thorson Quintet performs. A critically acclaimed vocalist, Thorson is also an accomplished composer, arranger, lyricist, and educator. She is leader of her quintet, which includes Tim Ray on piano, Mark Walker on bass, George Schuller on drums, and Cercie Miller on reeds. 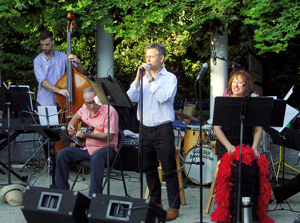 Swingin’ in the Fens is an annual, free outdoor concert presented by Berklee College of Music, the Fenway Civic Association, and the City of Boston Parks and Recreation.